Fees/Permits: Park fee, $5. Welch Rd permit, free. Not needed on weekdays. I’ve done Maguire Peaks twice. Last time I did it has a normal hike (rather than a run). That was toward the end of last year. That trip was cold-ish (around 45F). This trip was the opposite. Much of the southwestern United States is in the midst of a nasty heat wave. This includes Northern California. So I started early. The drive to the trailhead was uneventful, with the exception of having to stop for a bathroom break. With the lack of facilities anywhere nearby, I am fortunate the road was deserted at the early hour. Ha! When you get to the trailhead, there’s a very small parking area, and a gate that says “no parking.” I’m pretty sure that explicitly means not to park directly in front of the gate. Minus the space where the gate is, I’d say there’s room for 2-3 vehicles. However, if you’re in a car, I would avoid parking here — the angle between the road and parking area means you’re almost certain to scrape something on your car. I parked up the road about 400-500 feet, at a nice wide section great for parking 3-4 cars along the road. Even starting around 6am didn’t give me a complete reprieve from the heat—it was around 75F when I got going. I could feel the previous days’ heat radiating from the ground. Heat tends to be my worst enemy when running or doing any physical activity. Having grown up in the Northwest, and working in an air-conditioned office have made it difficult to ever get acclimated to any kind of heat. Nonetheless, I was quite glad I was getting an early start. This trail starts out as a fairly moderate climb along a double-track trail/road. It’s pretty well-groomed on this section, but other sections get pretty overgrown further along. If you’re going this time of year (spring/summer), wear pants and gaiters, or at least gaiters. I did shorts and gaiters. As is the case with most of the East Bay hills, this area is grazing land. This, combined with a big rainy season, makes for some rough trail in places. The views start to appear fairly quickly. 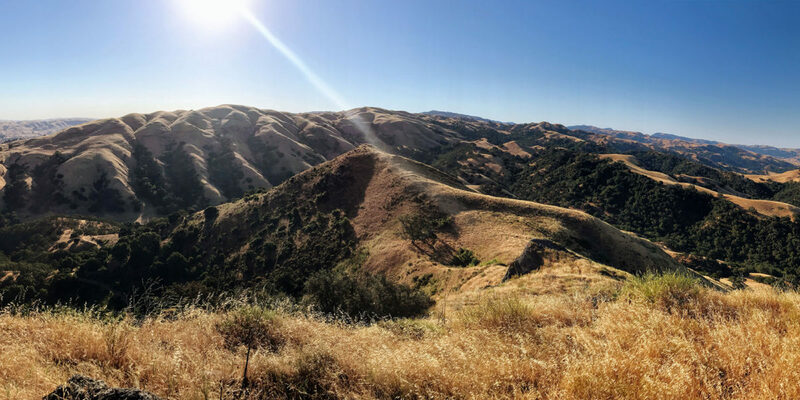 You’ll be rewarded with views of surrounding hills within the first half mile, and you’ll get your first glimpse of Maguire Peaks just before the one-mile mark. Right after the above-pictured section, you’ll go downhill for a little while, before starting the climb back up. There are a few options on how exactly you get to the summit. I’m covering the turns I made to get the summit. In the end, of course, it is up to you how you get there and back. After taking this first turn, the trail gets quite overgrown. If you want to avoid this, I’m sure you can go straight instead, and just hike a little bit farther. This left turn is a bit of a shortcut to the southwest side of the big loop that goes around the Peaks. You’ll have to kind of feel your way through this section, though the trail is usually visible. It’s only toward the end of the shortcut that it takes a sharp right and disappears. When I last took it (6 months ago), it was a very visible, pleasant trail. This connects to the main loop trail, where I took another left, to follow the loop around the west side of the Peaks. At about 2.1 miles, there’s a use trail that departs the loop trail off to the right, to follow the ridge line right up to the top. This section was very overgrown with tall grass and thistle. Definitely excellent tick habitat. Also, very steep! This climb is less than a half mile, but it’s a good chunk of elevation. But it isn’t long before you suddenly come upon the summit. There are actually two summits—hence the plural name “Maguire Peaks.” The western summit is the higher of the two, and thus the designated SOTA summit. I was tempted to go visit the other one on this trip, but didn’t end up doing more than look at it from this summit. I wanted to get a little bit off the summit so I could face east, so I worked my way through the shrubs/trees on the east side of the summit on (sort of) a trail. The view to the east turned out to be quite rewarding! This being only the second time I’ve deployed my end-fed half-wave antenna in the field, that process took me a little longer than I would have liked. Also, doing this trail-running style means I can’t bring as much supporting equipment as I’d like. Nonetheless, I did get the antenna up, into sort of a janky inverted-L configuration that sloped down the hill to the south. The top of the “L” couldn’t have been more than 10 feet off the ground. The nice part of the setup, however, was that I had my radio up on a rock, and I was able to stand in front of it to operate. Knowing the wind would be a little bit crazy at the top with the impending heat wave (it hit over 100F later in the day), I had brought along some earbuds. Boy, was I glad I did! Updrafts from the valleys below were whipping up over the summit with hot gusts of 20-30mph! I got to operating on 40m. I checked a seemingly quiet frequency to see if it was in use, and right away had a station come back to me, getting my first QSO into the log. An interesting one, too—Tony XE2/K6IGZ down in Baja California (Mexico). He was getting ready for the Chubasco Net. I changed frequencies, made sure I had a clear one, spotted myself and called CQ for a while, with no luck. So I switched to 20m—un-linked my half-wave wire, and re-adjusted the matching unit. I found a clear frequency there, spotted myself, and had QSOs with Gary and Martha in Kansas within fairly short order. They were coming in pretty weak, but quite intelligible. But no more contacts came on 20m. So I switched back to 40m and got a couple more, including one station in Southern California that practically pegged my S-meter! With the local time of day (around 8am), I wasn’t too surprised that 20m wasn’t hopping. And it would appear that with my sloping inverted-L configuration, I may have had some directivity to the south—the really good signal reports came from stations to the south. I’m going to continue to work on refining my use of the end-fed antenna setup — it truly is the lightest configuration I can bring up a mountain. I’m working on learning CW to be able to lighten my load a bit more, but until then, it seems like I can successfully do trail-running SOTA activations—even with the SSB HF rig! You’ll see on the GPX route I linked, I took a different way down from the summit. That was not intentional. If you don’t want to add distance to your hike, you’ll want to make sure you follow the correct ridge down from the summit! All in all, this was a pleasant and beautiful journey. I’d definitely recommend hiking here—just try to avoid it when it’s going to be hot!